I hear these kinds of comments more often than you might think. Today, I decided to reflect on that, and share some advice on how to give feedback to other writers–and how to ask for it, yourself. We all arrive at moments in our writing process when we want to share our work for feedback. It’s hard to find good readers, hard to give useful feedback, and hard to revise based on feedback that leaves you confused or uncertain what direction to go next. Asking for feedback–or being asked to give it–raises complicated feelings! When I review a piece of reminiscence writing, the first thing I do is read it through start to finish, no red pen in hand. I just observe my reactions to it. How does my heart feel? Where do I feel a pulse quickening, where do I feel lost in abstract thought? Then I go back through it, assessing the clarity of the writing. Could I tell what was happening, moment by moment, scene by scene? Did I know what I needed to know, when I needed to know it? Is there anything about the structure of the piece that is working particularly well, or particularly poorly? Finally, I go through it one more time, this time reacting at a sentence level. Are there great word choices, active verbs, ones that create scenes in my mind? Which of the writer’s tools has this author used well–like metaphor and simile, or humor, or description, or characterization? From these musings, I try to distill some helpful critique I can offer. I try to include some pep talk for the person, but mostly, I focus on talking about the work itself. I offer specific observations about what I find good, what is not working for me, and what I would do next if I were the one sitting down to revise the piece. Here’s the thing about giving feedback, when we’re dealing with true stories well told, the real stuff of life: It is incredibly hard to separate the storyteller from the story. It’s hard to focus on the writing when the subject matter is weird, wonderful, human lives. 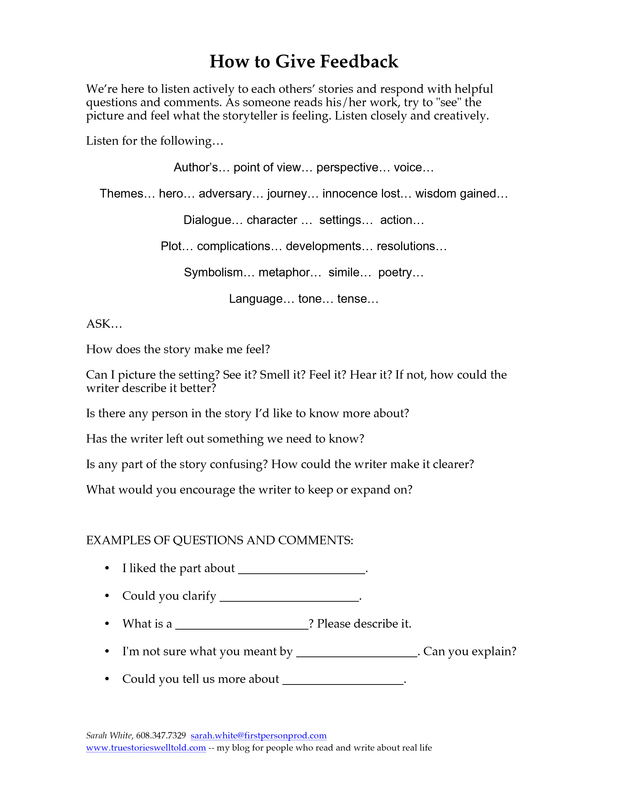 Below is a handout I use in my workshops , to help get a group of writers ready to give each other useful feedback. As for the other, deeper problem of showing your writing to your family and hearing nothing back–You could make it easier for your readers by giving them this handout. After all, the people you’re showing your memoir to probably have zero experience giving writing feedback. Be clear with them about what would be helpful for you to hear. There’s one more thing I tell my writers… if you share your reminiscence writing with someone and they respond by telling a memory of their own, count it a win. You moved their heart. This entry was posted in writing workshop. Bookmark the permalink. This should be helpful for memoir writing groups, particularly when members have not participated in writing groups before. Thanks, Sarah.